Shane from Clinton, Donald from Franklinton & 35 others bought this item recently. This new E Juice, Island Man by One Hit Wonder E-Liquid is now available but it’s going very fast. Our first shipment sold out in a hour and the second shipment we received yesterday is going pretty quick. If you are on the fence we suggest that you just pick up a bottle before it is sold out again. 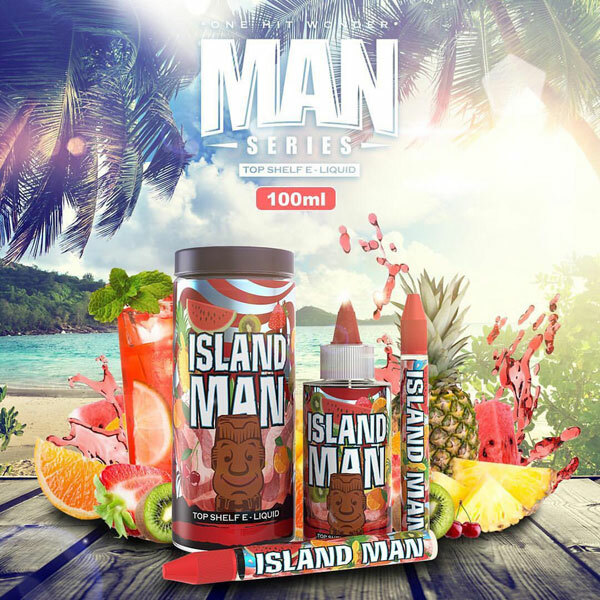 So far everyone who has purchased Island Man eJuice has been very happy and that is not surprising, this juice is excellent. This is the first time we are stocking all 3 strengths, 0mg , 3mg, & 6mg and we are super excited about expanding our customer base. We will update this page once we get our Shop Sample Bottle to let you all know how we like it, but we already know this E-Liquid is going to be excellent. 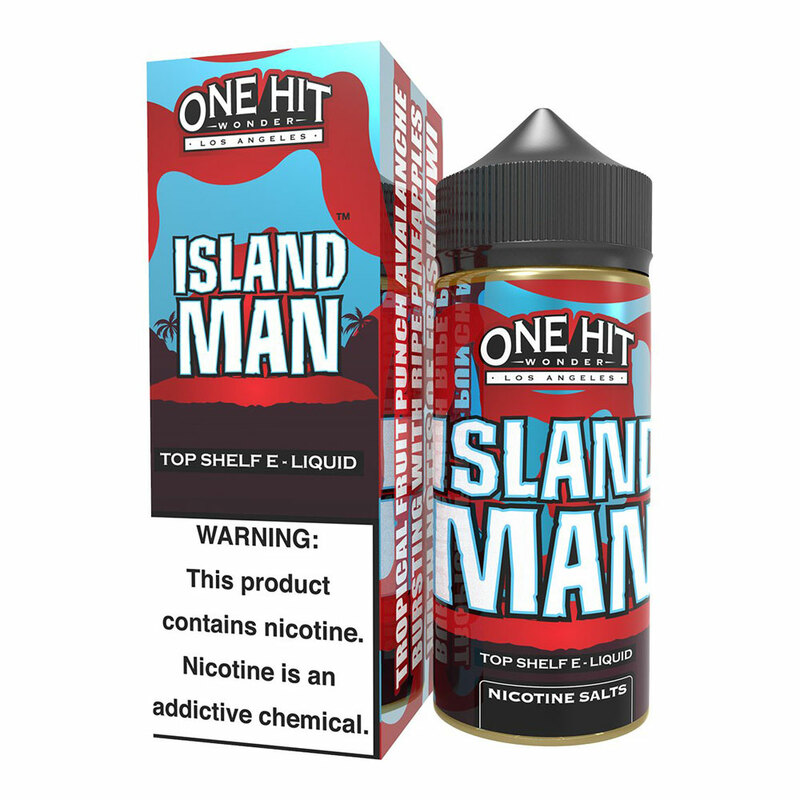 We have updated the Review Tab on the right with our Island Man eJuice Review. All One Hit Wonder E-Liquid is 100% made in the USA. You can be sure that Island Man E Liquid will be some high quality juice. This is also the first time we are seeing the brand new TruNic 2.0 USA Nicotine. This new version of TruNic is double purified and super pure nicotine. Expect more of a throat hit than the usual One Hit Wonder E Liquid. Please also keep in mind that we were the first shop to receive this product which means that the eJuice did not have a chance to sit / steep at all and it’s going to be super fresh. This E Juice comes in a100ml Squeeze Bottle with the usual 2 empty 15ml Unicorn Bottles to fill up. We also send a free Unicorn Bottle with every Order. The Unicorn Bottle we send has a much wider mouth that allows you to squeeze juice into it much easier. From One Hit Wonder: Legend has it, the Island Man rose straight out of an ancient volcano with the sole purpose of spreading the most delightful tropical flavors all over the world. Succulent, sweet, island fruits are infused together to create an invigorating wave of fruit punch. Review Coming Soon…Review Tab to the right has been updated. This E Juice taste just like Tropical Fruit Punch and it is absolutely delicious. You will be able to taste a full range of fruit flavors that makes you want more and more, it’s addicting to say the least. It really is that good. We believe that Island Man by One Hit Wonder is going to sweep the nation. So pick up a bottle today and you will not regret it. Really good flavor. Nice and mellow. Only thing I did not like about it gunked my coils up after 2 days. But the flavor was amazing! Taste as described.This is my new favorite, bought 4 with no regrets. Not too sweet not too dull, one hit wonder on a roll! Fast shipping, good customer service, im happy all around. I typically do not do reviews but I have had such good service from The Best Vape that I decided to write this. I am really enjoying this juice but more importantly I truly think this company is one of the best….thank you The Best Vape! Wow, that’s the first word that comes to mind. This E Liquid is absolutely fantastic. It’s by far the best E Juice we have had in a long time. We are very excited about this new flavor! Island Man taste exactly like Fruit Punch, with a Tropical twist I guess you can say. It’s not too sweet, it’s perfect. It is a very light colored juice & so far it hasn’t killed our coils or cotton. From the first inhale you will love it like we do. Keep in mind we try new flavors every day. Companies send us their juice all the time. We never sell a product without testing it, and we definitely don’t sell it if we don’t really like it. This means we have a lot of incoming juice to try! It takes a lot for us to say we love a juice. We have never publicly recommended e E Juice because everyone has their own taste / preference. Well that changes today, we are now publicly recommending Island Man by One Hit Wonder. If you like Fruit Punch this will easily become your new favorite ADV.